You're listening to Dorogoi Dlinnoyu, Susan's arrangement of the Russian folk song upon which Those Were the Days was based. "The Houston Press has described Susan McDonald as a "Guitar Goddess." New Classics describes how she "combines brilliant musicianship and flair with sensitivity and warmth." 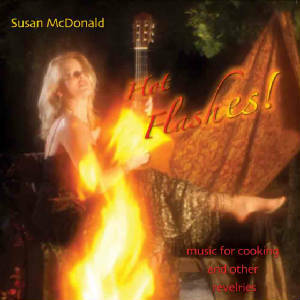 After spending several years dedicating herself to composing and playing music in hospitals, schools and hospitals, the self-admittedly eccentric McDonald has put together an album of hot little pieces that she has written and arranged for solo guitar. Even though she's known as a classical guitarist and has been described by German newspapers as "the first woman to follow in the footsteps of Segovia," be assured that she ain't your Mama's Segovia! Susan has taken well-known Russian music (such as the original version of Those Were the Days, My Friend) and tangos (such as La Cumparsita - think Hernando's Hideaway) and put her unique, somewhat manic spin on things. Be warned - she's added a bunch more notes. Then she's gone the next step and written pieces inspired by her surroundings. Her travels to Mexico inspired Las Puertas de San Miguel (she's even given a nod to the famed Cafe Ten-Ten Pie with a hot little tango) and her delight in strange sea creatures is evident in The Pom Pom Crab and The Conch. The idea behind Hot Flashes! is to make you feel as if you're spending the evening with good friends, good food and good wine. From the first piece, Home, Sweet Home, which begins with her tapping on the guitar to signify the arrival of guests to The Cleaning Crew and finally to The Birthday Tango, which is destined to become a classic, you will be made tipsy by this enchanting music!"